How would you love to spend your vacation off the beaten path this summer? How would you love to show off your photos from your recent vacation in the country to your friends? 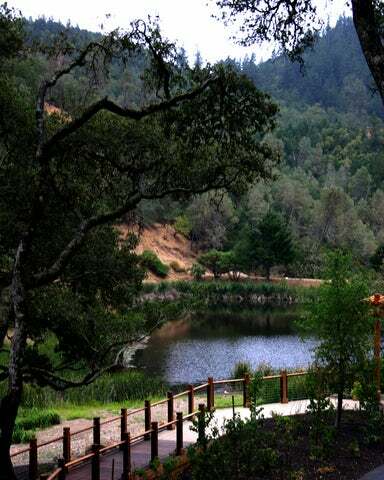 If you dream of going somewhere unique, then you are the kind of guests that Calistoga Ranch welcomes to its 157 acre paradise that is punctuated by ancient oaks, a private lake, a rocky stream and majestic hills. With 50 luxury rooms, a rich Napa Valley culture of wine, food and nature and world class staff, this resort is nothing like you have ever experienced. It offers the ultimate holiday experience in terms of food, wines, comfortable accommodation, and a variety of recreational activities. There are 50 free standing lodges within the ranch. Accommodation at the ranch is divided into: Deluxe Lodges, One Bedroom Lodges, Two Bedroom Lodges, and the Estate Lodge. The accommodations were designed with guest's maximum comfort in mind. They feature facilities such as fire places, original down duvets, Italian linens and botanical bath products. The rooms are tastefully decorated in luxurious and warm Napa artwork and are expensively furnished with wooden furniture. They feature floor to ceiling windows that open to the pine forests beyond. Within the resort you will find the Auberge Spa that brings back the time tested curative treatment in a natural setup. From garden showers and private soaking tubs to taking the healing mineral waters and bodywork treatments; this spa takes your spa experience to a new high. For your dining needs, your taste buds will be taken on a tour of exotic and delicious cuisines at the Lakehouse restaurant. This restaurant is renowned for providing romantic dinners and culinary feasts with unequalled excellence. The fact that you will enjoy your meals as you look over the Lake Lommei makes this dining experience even more splendid. The seclusion of the canyon allows this ranch to retain the exclusivity that is desirable for teambuilding retreats. The expansive 157 acres of mainly forested areas gives the team enough time to relax, unwind, get to know each other and even engage in games that requires team effort. For weddings and other social events, you are well advised to try the 1175 square feet wine cave that offers the alluring details of the iron wrought chandeliers. Other facilities available for use include; Lommel Lawn, Lake View Suite, Lakehouse Restaurant and Patio, Creekside Clubhouse, Vineyard Venue, and Upper Terrace. Popular recreation activities at the ranch include fine dining, campfires, hiking, photography, birds watching, camping etc. Feeling inspired? Contact us today and we will get you packing.